Metro Riders Petition to "Save the Blue Line"
In anticipation of the opening of the Silver Line, Metro will start running fewer Blue Line trains, but riders are fighting back with a petition called "Save the Blue Line." At issue is how many trains can fit through the Rosslyn tunnel during the morning rush. The Blue, Silver and Orange lines all meet at the tunnel, but there are only so many trains that can get through at rush hour to go into downtown D.C.
Beginning Monday, Blue Line trains will be reduced so that the Silver Line trains can get through. 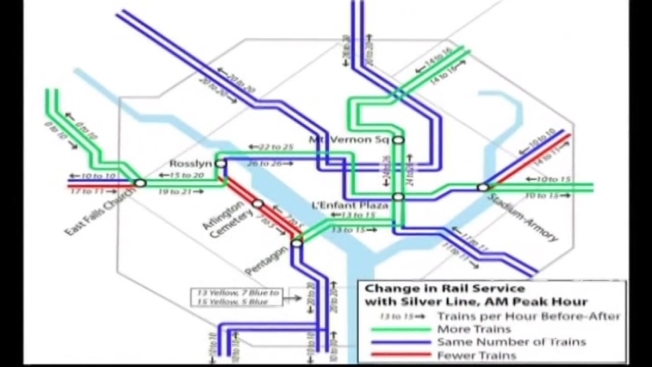 Trains headed to Arlington Cemetery and Rosslyn will be cut back. Metro points out that if Blue Line riders transfer to the Yellow Line, they can get to some downtown points faster, but the group argues that changing trains will take nearly as much time. The person who started the @SavetheBlueLine Twitter handle says Blue Line riders will spend an extra 15 hours waiting for trains each year once the change goes into effect.